In a bowl, mix the flour with all the other ingredients up to and including the yeast. Add the butter and all the other ingredients up to and including the milk, mix well, knead to form a soft, smooth dough for approx. 10 mins. Cover and leave to rise at room temperature for approx. 1 1/2 hrs. until doubled in size. To shape, divide the dough into 12 portions. Shape the dough into balls, inserting one chocolate egg into each ball. Place the dough balls on the prepared tray at equal intervals. Cover and leave to rise at room temperature for a further 30 mins. Brush with egg. Bake for approx. 30 mins. in the lower half of an oven preheated to 180°C. Remove from the oven, allow to cool on a cooling rack. Mix the icing sugar and milk until thick. Spoon approx. 1/4 tsp of icing on top of one of the buns, immediately place 3 sugar eggs on top. 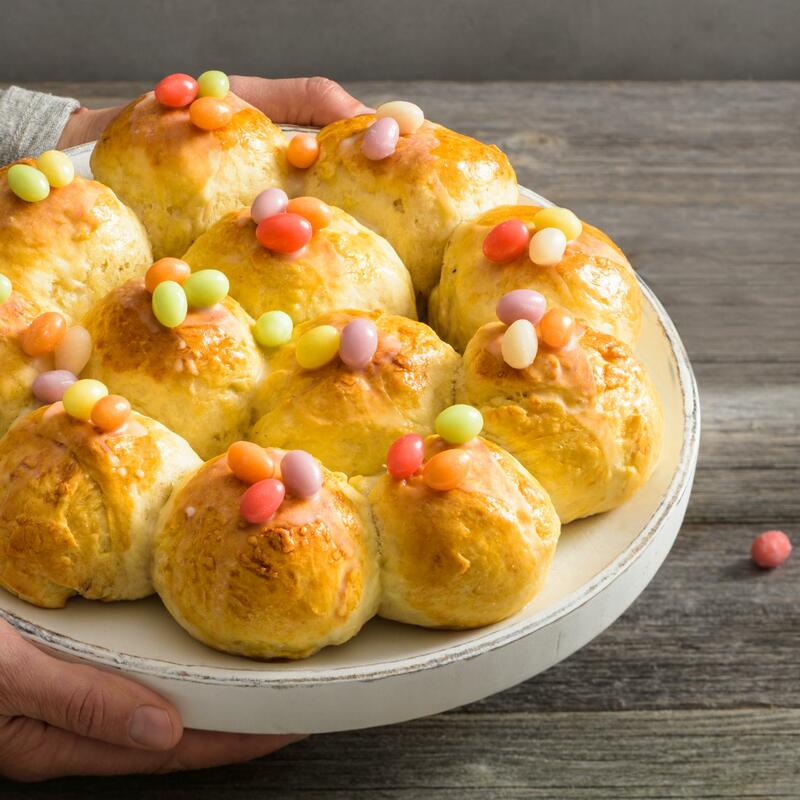 Decorate the remaining buns in the same way, leave to dry.